You are currently browsing Jessica’s articles. It’s December and we’re all a bit tired. 2018 was a hard year. If modern women were allowed to “take to their beds” like Victorian women often did, I would have done so. The next best thing was to bury myself in books. This year I read not only the most I’ve read in a decade – 30,000 pages and counting (thank you to Goodreads for the calculation), but I read some of the best books I have in years. This year I tried very hard to incorporate diverse voices with stories by and about POC, LBGQT+ and women. The real world might have been a burning, stinking dumpster fire this year, but the reading world was such a joyous experience. Here are my favorites. Space Opera by Cathrynne Valente. Ms. Valente is probably the best author you might have never read. Despite being quite prolific, brilliant and hilarious, she’s not generally popular (though she absolutely should be). She has a decidedly cultish following, of which I am a proud member. If you only ever read one of her books (and I recommend you read ALL of them), it should be Space Opera. As the title suggests, it’s a space opera – about SINGING IN SPACE. Get it? Amazing. As always, her writing style is mind-bogglingly, psychedelically wonderful. Her prose is to be savored, not rushed through. The characters are compelling, and the story is laugh out loud funny. Honorable mention: The Power by Naomi Alderman. In the year of #MeToo, this book was cathartic and thoughtful. The premise is that young women around the world suddenly have the power to send electric shocks from their body. These young women are also able to awake this power in adult women. The shifts in power, politics and culture that result are instantaneous and the fallout is fascinating. Monstress Volumes 1-3 by Marjorie Liu. These comics are gloriously drawn and are both breathtaking and terrifying to look at. The story involves a non-human young woman named Maika Half Wolf and her discovery of a monster that lives inside her, one that she cannot completely control. Her dystopian story of self-discovery is violent and mysterious and filled with fantastical creatures and characters. She is a warrior and fair warning; this comic is often graphically (pun intended) violent. Definitely not for kids. The Prince and The Dressmaker by Jen Wang. This book is just plain wonderful. It is the story of a prince who loves to wear dresses and the seamstress who helps him awaken into his true (beautiful) self. It’s about self-acceptance and unconditional love. Beautifully drawn with engaging characters, this book is great for both children and adults. Delilah Dirk Volumes 1-3 by Tony Cliff was one of my favorite series I read this year. Delilah Dirk and her companion, Selim (who she almost haphazardly picks up on one of her adventures) are one of the best relationships I’ve seen in middle grade writing. Their repartee is funny and interesting and real. Full disclosure: My 8-year-old daughter had zero interest in these. I, on the other hand, found it delightful. This year I discovered Anne Bronte and I’m here to tell you she is by far the very best Bronte sister. It is a tragedy that she only published two books. Tennant of Wildfell Hall is the better of the two. The story is mysterious and compelling. It must have been downright scandalous at the time. Anne’s mature and full realized characters reveal just how shallow and flighty those of her sisters’ books are. She’s definitely the Bronte for adults. Shrill by Lindy West. On page 3 of, Ms. West writes about the body positive role models of her youth. She begins her list with Lady Kluck and Little John aka Baloo (in drag) from Disney’s Robin Hood. Like many women of a certain age, this movie is a touchstone of my childhood; it is part of my DNA. So when I read this, I was filled with pure joy. I have never fallen in love with an author quicker. I recommended this book to my sister based solely on those 3 pages. The rest of the book did nothing to dampen my adoration. She is a voice everyone should hear. BONUS: Shrill is becoming a TV show starring the gloriously funny Aidy Bryant. The Raven Boys by Maggie Steifvater (4 books total) is one of the best fantasy series I’ve read, not just this year, but ever. It has a bit of teen romance among an overarching story involving dead kings, magic, ghosts, and demons. Despite what the “boys” of the title may suggest, there are many strong female characters. The plot is intricate, and each book is a page turner. If you like her writing, I also highly recommend her standalone novels All the Crooked Saints (her best work so far) and Scorpio Races. The Shadow and Bone Trilogy by Leigh Bardugo. Nothing I can say would do Ms. Bardugo justice. If you like Fantasy, just do yourself a favor and go ahead and read everything she’s ever written, including the Six of Crows Duology and The Language of Thorns. I read her entire works in 2018 and I look forward to her new series coming in 2019. Small Animals by Kim Brooks. In a dumpster-fire world, it’s not hard to feel anxious or terrified. As a parent, it’s especially hard to keep actual danger vs. perceived danger in perspective. This book is part memoir of a fearful parent and part researched assessment of today’s anxiety-ridden parenting culture. 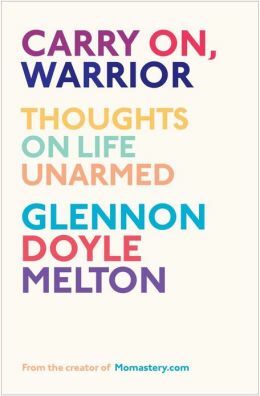 It explores why we are so afraid and what we can do about it. A must read for all parents. In this banner year of books, my absolute favorite was Thisby Thestoop and The Black Mountain by Zac Gorman. A middle grade book about a girl who grows up as the gamekeeper of monsters inside a black mountain. This book is funny and endearing, with a strong female main character and a hilarious assortment of supporting characters. My 8-year-old supports this rating. There is a revealing moment in The House with Chicken Legs by Sophie Anderson, a story about Baba Yaga, her granddaughter and a house with (yup) chicken legs, when I said “Woah” and had to place the book in my lap and breath for a second. It wasn’t so much a surprise I didn’t see coming, it was the unexpected emotional impact of what was revealed. This story is about Life and Death and Love and it doesn’t shy away from the impact of any of these things. 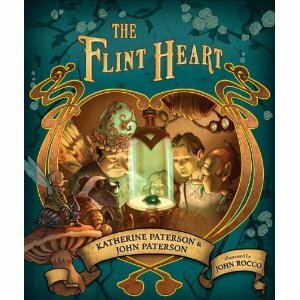 This book is written for middle grade; however, the emotional landscape of this story is powerful for adults as well. Both my mother and daughter wholeheartedly agree that this is a great read. Kate Morton is one of my perennial favorite authors. With The Clockmaker’s Daughter she doesn’t disappoint. Every time I think I’ve got her formula figured out, she surprises me. 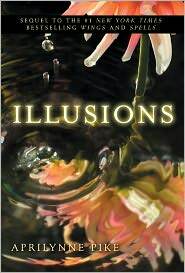 As with her previous books, there is a mystery and a multi-generational perspective. 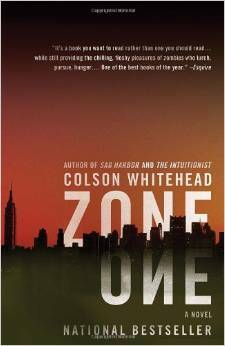 This book is ambitious with four different timelines. Ms. Morton handles this deftly and almost seamlessly. She makes you think you’ve got it figured out (you don’t). Neverworld Wake by Marisha Pessl. This story defies description, which is entirely the reason I loved it. It’s part mystery, part fantasy (there are some “time-y wimey” things happening), part existential teen angst, and part nihilism. I’ve never read anything like it. I love big words. I have a solid vocabulary, built on the foundation of obsessive reading since childhood. I rarely have to stop and look up words while reading. Although we have dictionaries all over the house, my husband instead often chooses to yell at me “what does X mean?” while he’s reading. But to me there’s a limit, a line between being well-read and being pompous. Which is not to say I don’t enjoy the impossibly big words too. It’s just that they’re too special for everyday usage. Like using Grandma’s fancy china for Sunday dinner, when you take them out everyone’s a little bit stiff and uncomfortable. And let’s face it, they usually come out when company is over and you’re trying to impress someone. I can’t tell you what word of Zone One first hit a discordant note for me. I think instead it was the general rhythm that felt clunky and ponderous to me. I do remember a vague jarring feeling after the first few pages. It’s the feeling that I would get (I imagine) if I saw a Shakespearean actor starring in a romantic comedy. I was uneasy. I was confused. I thought this was a zombie story. I don’t mean to imply that zombie stories aren’t smart. Or that smart people don’t read them. Clearly I’m a thinking person and I love zombie apocalyptic mayhem. But with this book I kept thinking what is going on here? We’re busting out the china and we don’t even have visitors coming. When on page 75 defenestration was thrown out there (pun intended), I audibly groaned. Who says that in pre-apocalyptic society? Besides overly literate teenagers having fun placing it in casual conversation. Are we assuming a higher level of erudition in the masses surviving zombie slaughter? We shouldn’t. My guess is the dudes slinging dead zombie bodies out windows would be saying “later motherfuckers!” On that same page came the words (also regarding the defenestration of zombie corpses) “. . .splashing him with ichor and grue.” So hard on the heels of defenestration, these words almost did me in. If I hadn’t just read a review in the New Yorker about Magic Mike XXL, I would have thought the world was ending. Clearly there are no boundaries for the highly articulate. There is no doubt that Mr. Whitehead is a clever writer. Sadly, his subtle, snarky asides reminded me of a precocious child screaming for attention in a room full of adults. I do not like precocious children. He wants us to see how clever he his. Which, being the contrary person I am, makes me want to ignore him entirely. THAT is what I want to think about when I think about zombies. I want the humanization of a world filled with unhumans. Tell me what it’s like to live with the undead and survivors. No fancy words required. Finally, begrudgingly I came to really like this book. I may even read it again, defenestration, ichor and all. By the end I was satisfied with story. It was simple and rang true. Blogs and Bathrooms, if that doesn’t say Mother’s Day, I don’t know what does. . . Happy Mother’s Day. Like 12 hours early. I feel like a rock star. Today I have time to blog. I’m timely. It’s a miracle. We’re going to broach a squirrelly topic today, reader(s), one that we’ve never tackled before. You all do it, so don’t pretend you don’t. If I admit it, will that make you feel better? 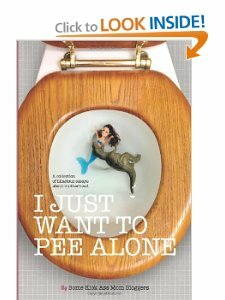 Ok, I read in the bathroom [be warned, there is some good poop talk below]. Not just magazines. I read books. (Incidentally, while we’re on the topic, I told my husband that the bathroom is OFF LIMITS for our shared Kindle – I hope that’s not too unfair). I get a lot of good reading done in there. Or at least I used to (more on that in a minute). Seriously, I read 205 pages of Uncle Tom’s Cabin in the can. In hindsight (pun intended) that was probably not the best choice, but I was pregnant at the time and well. . .I digress. Lean In: Insert something witty here about the hokey pokey not being what it’s all about. I’m a little weary of women attacking other women. I’m tired of hearing about the “mommy wars*” of the various types, so many that it bores me to reiterate them here. I would really love to get to a place in our society where women can be whatever kind of women (or mothers, or not-mothers) that we wish to be without feeling the need to circle the wagons every time we make a decision. For instance, I have a friend who exclusively breast feeds who feels that she doesn’t get enough support. I bottle fed and feel that I was pressured to breast feed. We live in the same world, how is this possible? Because everyone is feeling judged. And that’s because we are all judging each other, women especially. And mothers MOST especially. It’s that time of year, Game of THRONES, my friends. Are you geeking out? I am. Hard. Core. I resisted this show for two whole seasons, but in the end, pre-baby ‘bed rest’ boredom, plus my inner fantasy fan (ok, OUTER fantasy fan) won the day. And as if often the case, once I committed my whole heart, after binge-watching two seasons (and frankly, switching cable carriers to get HBO at a great deal for Season 3), I made my way to the books. I’m happy to admit that A Clash of Kings was the first book I read on my Kindle. While I’m still not in love with the technology, it did save me lugging around an enormous book while also lugging around an equally enormous newborn. But we’re not here to talk about A Game of Thrones, or A Clash of Kings. That’s SO last season(s). We are here to talk about A Storm of Swords. I feel sorry for Ms. Morgenstern. What, you say, that’s crazy! She got an almost obscene advance for her very first novel with nary a writing credit to her name. The movie rights have already been sold (were sold before the book was published) to the makers of the Twilight movies. Rumor has it Harry Potter’s simply magical David Heyman will produce. What’s to feel sorry for? 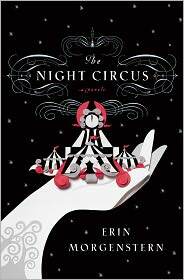 A) According to the Wall St. Journal, publishers, book sellers, movie producers, marketing gurus everywhere, and (not incidentally) readers, all think that The Night Circus will be the next Harry Potter! B) I’ve read 49 pages of Night Circus. It’s not Harry Potter. Hold up, wait a minute (put a little boom in it. . .). This is not a bad thing. Or a good thing. It’s just, well, a different thing. I was in a chain bookstore the other day and walked through the YA section, as is my wont, when I saw this heading on a shelf – “YA Paranormal Romance.” Well, it’s been quite a while, but I’m pretty sure that all teenage romance is paranormal, so it seems to me a bit redundant. We can probably thank, for lack of a better word, the Twi-hards for this. Anything dealing with vampires, werewolves, dragons, and zombies is hip right now, as long as it involves some heavy sighing from lovelorn girls and the breathtakingly beautiful young men who inspire such, ahem, expiration (that’s one chock-full, respiratory metaphor right there). Aprilynne Pike has her own version of this, but hers is about fairies. This would be a hard sell if not for her ingenious vision of fairies – they are actually plants, not little flying humanoids like Tinkerbell. They are human sized, they have human habits and they are – male and female – exceptionally beautiful. Sounds like a winner for sure. There are some obvious parallels between Ms. Pike’s books and the Twilight series, which is to say that all teenage romances are the same formula – girl meets boy and likes boy a lot, girl meets other boy and also likes him a lot. Boy fights boy over girl. Sexual tension ensues. Only now there are the added bonuses – someone gets bitten, someone shape shifts, someone tries really hard not to eat his girlfriend. But the Laurel Series in many (many) ways are not even in the same category as those vampire books.